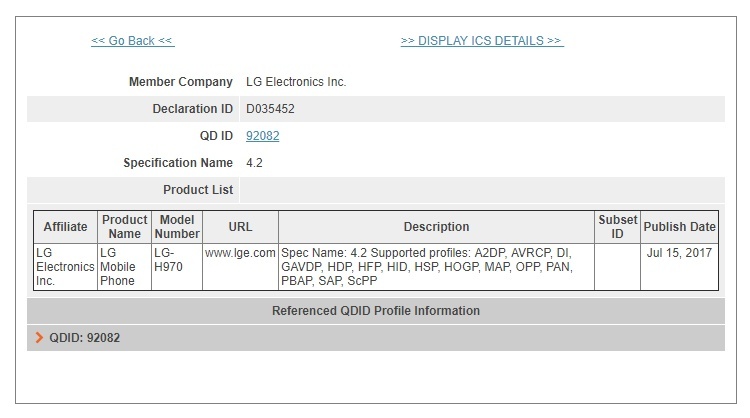 LG’s upcoming flagship phablet, the V30, has just been certified by the Bluetooth SIG. The listing on the Bluetooth SIG website for the H970 reveals the smartphone features Bluetooth 4.2 and not Bluetooth 5.0 that is seen on most devices powered by the Qualcomm Snapdragon 835 processor. However, it does not mean that the V30 will not be powered by the Snapdragon 835 chipset. HTC’s U11 too runs on the Snapdragon 835 SoC and features Bluetooth 4.2 instead of Bluetooth 5.0 on the Samsung Galaxy S8, Galaxy S8+, and the Sony Xperia XZ Premium. According to rumors so far, the LG V30 will feature a similar bezel-less FullVision Quad HD+ display as the LG G6. There is still some confusion regarding the exact display size, but most sources seem to suggest the V30 will sport a 5.7-inch display, identical to the G6. What will be different, however, is the panel type. While the G6 sports an IPS panel, the V30 is expected to be LG’s first flagship smartphone with an OLED display. The panel will be sourced from LG Display, a subsidiary of LG Electronics. Apart from the switch to OLED, rumors suggest LG will increase the screen-to-body ratio even further, which means you can expect to see even slimmer bezels than on the G6. In terms of hardware, the G6 will be powered by the octa-core Snapdragon 835 chipset, coupled with 4GB of RAM. However, some recent reports suggest the phablet could even be equipped with 6GB of RAM, which would make it LG’s first flagship with more than 4GB of RAM. For audiophiles, the V30 will offer an upgraded quad-DAC setup with improved audio quality. In the camera department, we expect LG to retain the 13MP + 13MP rear dual camera setup seen on the G6. Keeping the lights on will apparently be a 3,200mAh capacity battery with wireless charging support.